2115.02.01 Stellar Pearl is complete, and the Republic’s first colony ship is away. 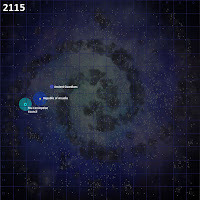 2115.03.03 In the Phi Lupi system, a ruin is discovered that reveals disquieting secrets concerning the galaxy’s history. 2115.05.24 Crew from the exploration ship Atlantis boards an abandoned cruiser in the Phi Lupi system, named Phi Lupi Conqueror. It appears to have some advanced technology. The crew is directed to return it to Arcadia Prime for study and disassembly. 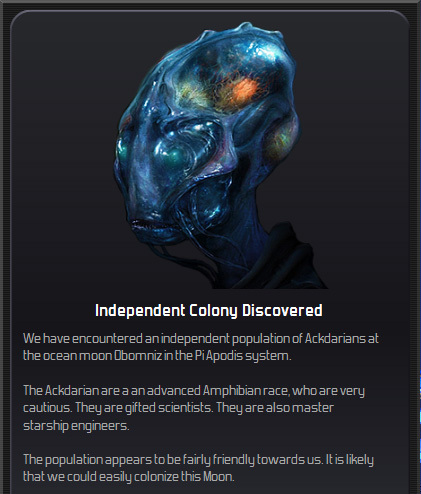 2115.08.22 Another independent colony of Ackdarians is discovered. These guys are everywhere. 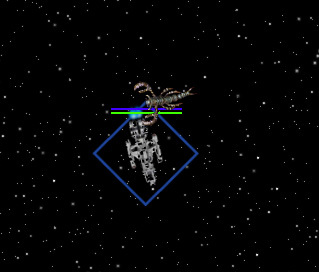 At the moon of Obomniz where they are discovered, a troop transport from the Tau Cassiopeiae (TC) Council is approaching the colony, but is being driven off by pirate fighter/bomber craft from the Mortalu Clan. The pirate mother ship is Rebellion of Eta Horologii, a powerful cruiser that outclasses anything the Republic can field. This discovery gives the senior officers of the RN a lot to ponder. 2115.10.11 It is a great day for the Republic. Stellar Pearl colonizes the planet Epsilon Comae Berenices 1, and renames the planet Berenice. 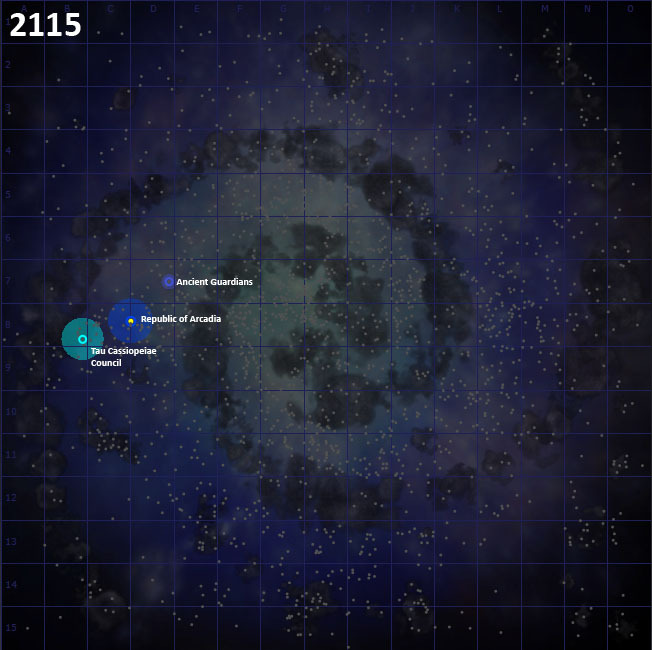 2115.10.30 2nd Fleet arrives at Desperado Lair, the hideout of the Grim Gang. Desperado Lair has a shield strength of 4000. 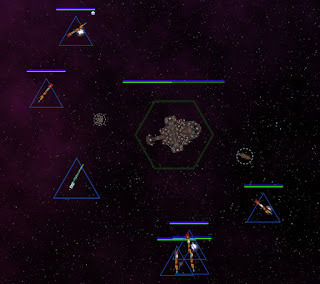 The corvettes unleash unanswered volleys of concussion missiles, but this will take time. 2116.01.11 One of the exploration ships comes in contact with a new empire, the Theta Velorum (TV) Syndicate, but also discovers the homeworld of the XHumans in the Relakis system. The exploration ship quickly gathers intelligence about the XHumans. Based on ship names and other information gleaned from the survey, the XHuman ships are both larger and more advanced than thos of the RN. The Senate is not particularly pleased with their despotic form of government, and so for the moment they decide to keep tabs on the XHumans and learn more about them. 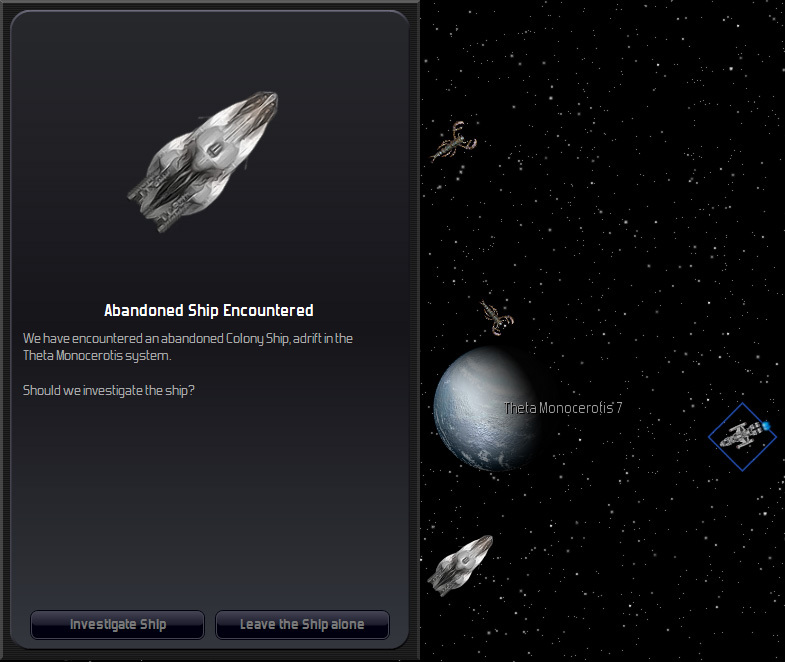 2116.04.09 In the Theta Monocerotis system, exploration ship EX-14 discovers an adrift colony ship. It investigates, being careful because a pair of Giant Kaltors--scorpion-like space creatures, are nearby. The crew investigates the colony ship, named Grasping Starfire. Inside the crew finds millions of Calephs, a reptilian race, sleeping in stasis hibernation. Grasping Starfire is ordered to colonize the Mu Leonis Minoris system but this alerts one of the Kaltors, which moves to attack it. EX-14 attempts to distract it, but the Kaltor attacks and destroys it. 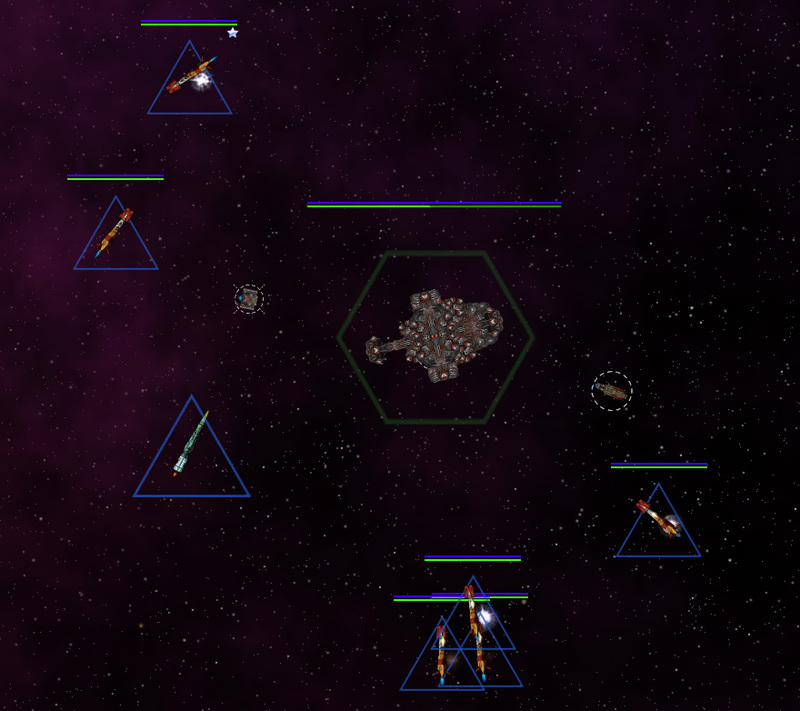 Grasping Starfire attempts to colonize Mu Leonis Minoris 2, but the colonization attempt fails, as the native population repels the colonists. All contact with Grasping Starfire is lost. 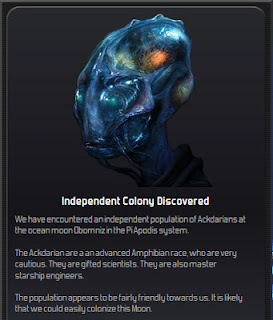 The Republic is unsure if the inhabitants of Mu Leonis Minoris 2 objected to the Calephs that attempted to colonize the planet, or if they are against the Republic itself. 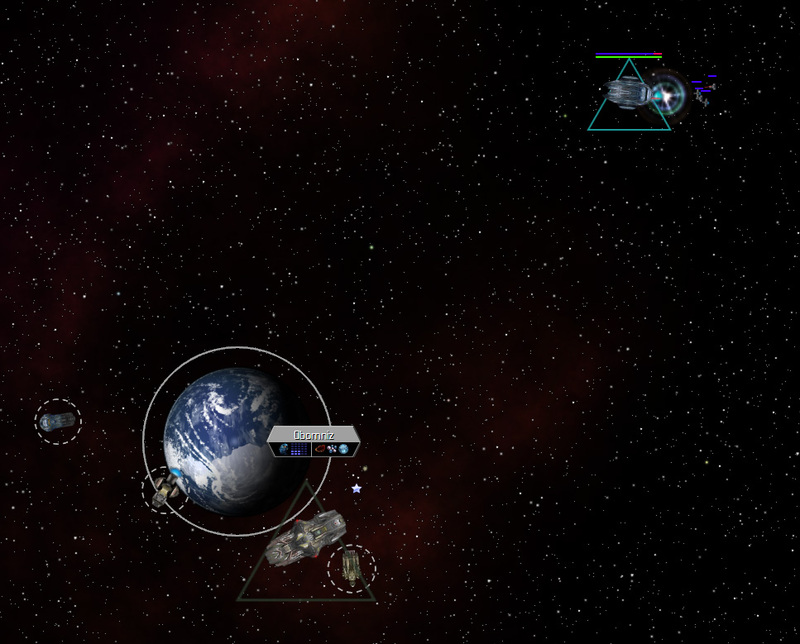 There are plenty of other planets able to be colonized, so MLM2 will remain independent for now. In the meantime, 2nd Fleet destroys the Grim Gang’s hideout, and the Grim Gang itself disbands, their remaining vessels surrendering to the Republic. This initiates celebrations throughout the Republic, but it also engenders a movement in the Senate to immediately cut back on military expenditures. The RN, it is argued, was formed specifically to protect the Republic from the Grim Gang. With that threat removed, there is no longer a need for the Navy. 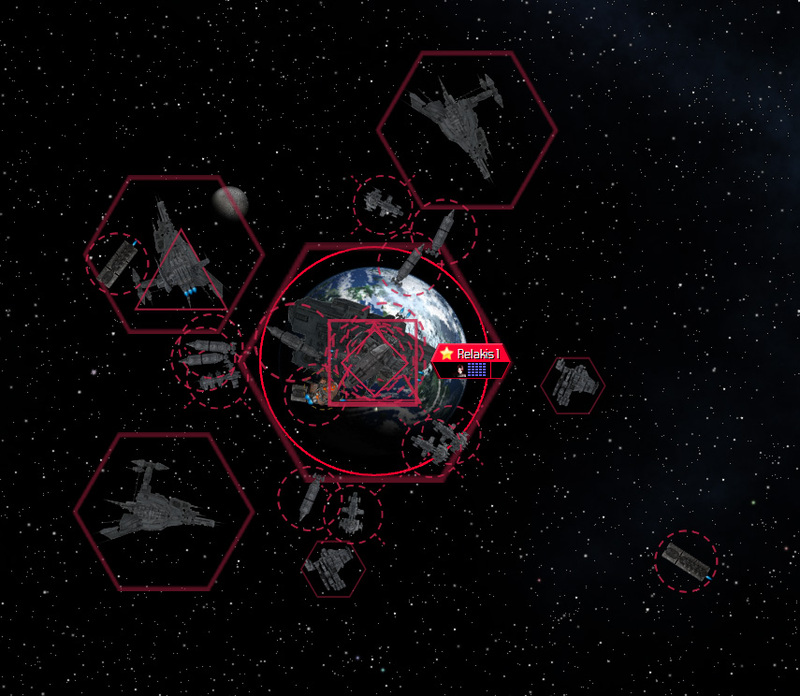 This view meets much resistance, as in the intervening time, many other pirate factions and potentially hostile alien empires has been discovered. They may be peaceful now, but there is no guarantee that they will remain that way. 2116.08.21 The hideout of Ackdar Shipping, a small space port named Lonely Nest, is discovered, and 3rd Fleet is dispatched to destroy it. Juno is still damaged, but it is deemed still capable of succeeding in its mission. The year ends just before 3rd Fleet arrives. It has been a busy two years. 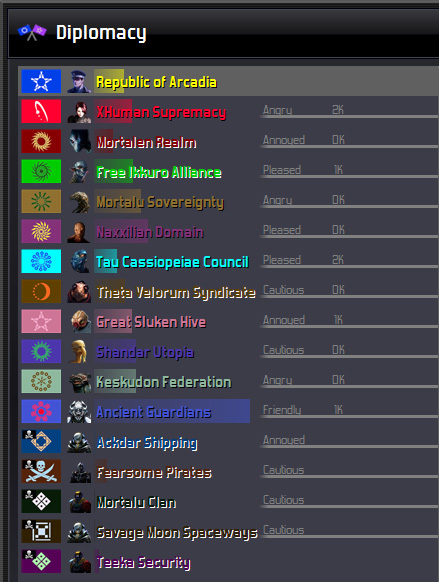 The Republic is now in contact with 16 other empires or pirate factions. Population-wise, the Republic lags behind the other empires. The Republic is 5th in number of colonies. And also 3rd to last in economy. Strategic value is also low. Military strength, while better than some other metrics, is still in the latter half of the group. It is a good thing that relations are generally peaceful right now. It also argues against a military draw down.